and with optional Rigel 12mm Kellner Guiding Reticle Eyepiece (30,099 bytes). Overview the Pulsguide is a versatile, relatively sophisticated and yet easy to use illuminator. It is designed to attach onto the illuminator port of an eyepiece equipped with crosshair or micrometer reticle. These eyepieces are commonly used in astronomy for guiding during astrophotography sessions, for measuring angular separations, or in finderscopes. The illuminator will illuminate only the reticle or micrometer of the eyepiece so that its pattern may readily be seen in faint red, contrasting against the night sky background. Construction Traditional illuminators incorporate a lamp or more recently a red Light Emitting Diode (LED) and an external variable power source. Most illuminators sold since the mid 1980's incorporate a red LED with a on-off switch with a variable intensity potentiometer, and self contained bateries - usually two 1.5 volt in series. While these devices permit the observer to adjust the brightness of the light source, they are either continuous on or off - these do not permit "pulsing" the light source. Over time, some observers noted that by "blinking" the faint red pattern of a sight or guiding eyepiece this made it easier and less fatiguing to observe the very faint objects in the background. Some amateurs in fact developed "blinking" circuits to turn the light sources of their sights on and off automatically. Company Seven was first introduced to Rigel products through the PulsGuide when it became offered through one of our suppliers as the unique battery powered illuminator for that supplier's Guiding Reticle Eyepieces, and now we offer products directly from Rigel. In referring to the advantages of the blinking principal, Phillip S. Harrington author of Star Ware states "...by not keeping the reticle on continousouly, fainter stars may be spotted and followed with greater ease." The most popular sights now offered by Company Seven either incorporate or offer optional "blinking" circuitry. But it was left to Rigel Systems to develop the first successful "blinking" illuminator for guiding eyepieces. The final form of the Pulsguide design was arrived at in September 1995 after much experimentation. Red and Yellow-Green LED. The operator can install either color LED to suit their preference. Low intensity red light is generally preferred at night because it has so little adverse impact on the observers night vision. This has been the traditional choice of color for guiding eyepieces, and night time sight reticle illuminators. The yellow green color at 510nm is regarded as the peak color sensitivity of the "scotopic" or dark adapted eye. Some observers find the faint yellow light (which is nearer to the 510nm peak color sensitivity of the scotopic dark adapted eye) makes the reticle of an eyepiece appear more distinct than with red light. As mentioned by Michael Covington in his book Astrophotography for the Amateur "I prefer dim green to bright red. The advantage of green is that I can be sure that my eye is focusing it in the same plane as the star mage." Michael also adds "I use a PulsGuide..."
Pulse Timing Control Dial to adjust how long the blinking LED stays "on", from a short blink up to on continuously. Delay Timing Control Dial to adjust how long the LED stays "off" between blinks. Male thread permits use with most guiding eyepiece that incoporate the metric 8mm thread. Optional thread adapters are available to permit use with 10mm or 14mm threaded ports. Engineered and made consistently well in the U.S.A. The PulsGuide is sold alone as an accessory, or Company Seven can furnish the PulsGuide with the Rigel Systems dual crosshair 12mm Kellner eyepiece. Guiding: these eyepieces were developed to be used for guiding a telescope during the course of extended astrophotography. Any telescope that is aligned may exhibit some drift from its proper course over time, this may be due to periodic inaccuracies of the Worm Gear, or deviation of the Mount from a perfect Pole Alignment. When a tracking telescope is moved so that a star is centered in the cross hair of this eyepiece, then any movement of the star from the center will become apparent to the observer, and then that observer can compensate for the drift of a star from center by making fine adjustments with the telescope's Drive Corrector. Pole Alignment: by making any N, S, E, or W drift motion obvious, the eyepiece can be use to improve the Pole Alignment of a telescope mount. PEC Setup: any acceleration or deceleration from nominal tracking rate due to periodic errors (high or low spots in a worm gear revolution) is easy to see in the eyepiece cross hair so one can use the eyepiece to program (or teach) a telescope mount equipped with "Periodic Error Correction" circuits to cancel out much of the error. For example a G-11 German Equatorial mount may show 18 or so arc secs of error per period of the worm normally, but with PEC engaged then this may be reduced to 5 arc secs or less! "Go To" Mount Alignment: most "Go To" computer control telescopes, and those with Digital Setting Circles are systems which when properly set up are quite adept at navigating the night sky for you. 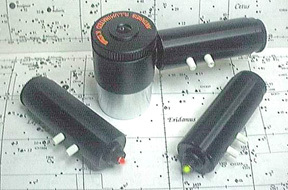 To use these portable telescope systems, or to set up an installed telescope in an observatory setting requires some precise alignment of the telescope mount with the aid of the telescope optical tube pointing at alignment stars, or 'landmarks" in the sky. But some persons new to this hobby find the initial set up of the telescope, and the precise centering mount indexing stars in a conventional eyepiece to be a bit of a challenge. Company Seven suggests you consider using an Illuminated Crosshair Reticle Guiding Eyepiece as a tool to precisely center stars in the field of view. This eyepiece can help the operator of the telescope very accurately center a star in the center of the eyepiece when setting up the telescope, and later if one wishes to check the accuracy of the alignment and pointing.